So, my studio is big. Really big. I mean, it’s not huge, but I don’t think any of us envisioned just how big it would be (or look) when it was all reframed with the raised floor and vaulted ceiling. And it’s just big enough that two HVAC guys have said that it could possibly be too much of a drain on our current HVAC system. They both said that with the spray foam insulation that we have, it could possibly work. Or they could do all of that work, and we could find that it’s just a bit too much, and that would be money and time wasted. Since it’s right on that question mark line, we decided not to chance it, so we’ll go ahead and install a separate system for the studio, mudroom, and half bath. 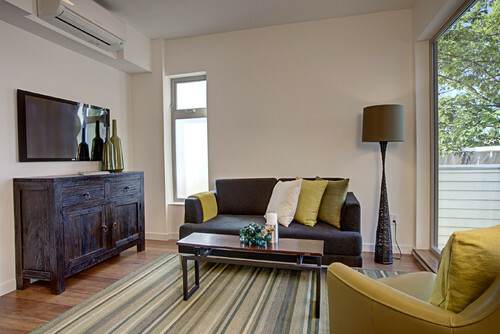 We have two options — a central HVAC system and a ductless mini split system. 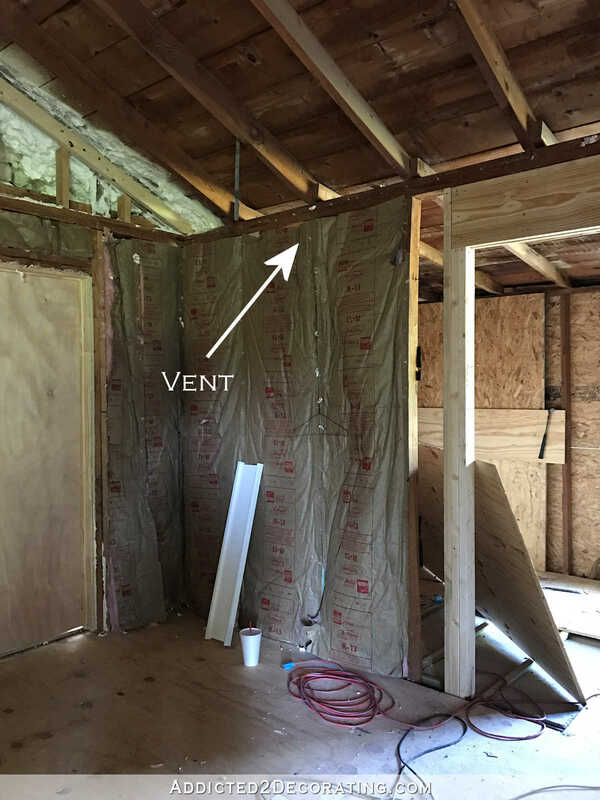 A central HVAC system is all hidden, and all you see are vents which can be placed on walls, in the ceiling, or even in the floor if you have a pier and beam foundation. Central HVAC systems are the standard here. It’s what I grew up with, it’s what I have now, and it’s just…well…the standard in this area. So I was dead set on a central HVAC unit…until we started talking about what would be required to make it work in there. First of all, I’d have to build a little closet to house the indoor unit in a corner of the mudroom. And the outdoor unit would sit outside just on the other side of that wall. Then I’d have a vent on this wall, which would basically be blowing right over my head in my “office” space, with a big intake vent on the wall below. And then on the other side of the cased opening, I’d have to have a second air vent, which would interfere with my plans for built-in cabinets on that wall. I wasn’t thrilled about any of that arrangement, but the thing I really couldn’t get on board with was that the ceiling in the mudroom and half bath would have to be dropped down on the high side to accommodate ductwork. That ceiling on the high side is eight feet tall, and it slopes down to 7.5 feet on the back wall of the house. Dropping it down enough to accommodate a 10-inch duct, plus a few smaller ducts, would turn it into a cave, and I just couldn’t make myself be okay with that. 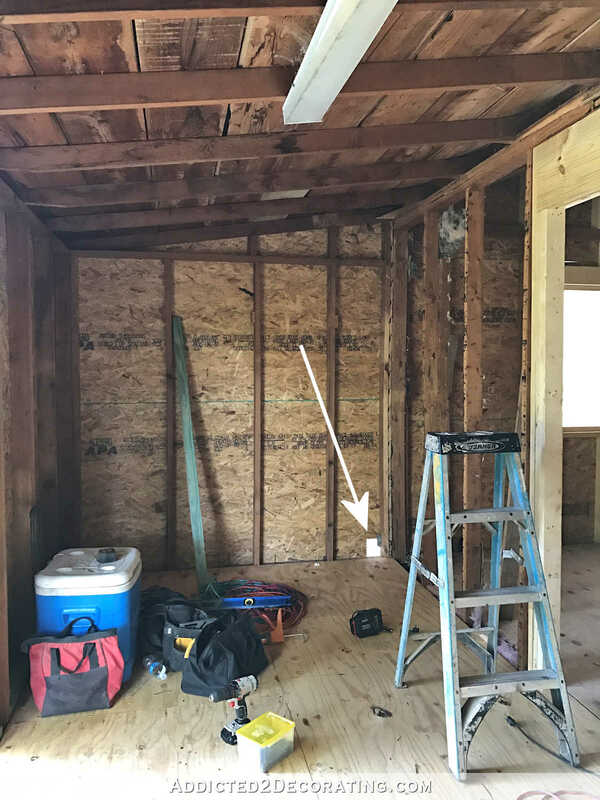 …and all of the electrical wiring and copper pipes could go through the attic, and the small outdoor unit could sit right by our current HVAC system’s outdoor unit to keep it all consolidated on the other side of the house. It’s operated by remote control, and it seems to me that this placement (as opposed to a vent blowing right over my head in my “office” space) would heat and cool the room more evenly. And best of all, it’s cheaper than a small central HVAC system by about $3000. So I’m pretty sure the ductless mini split is the right decision for this area of the house. 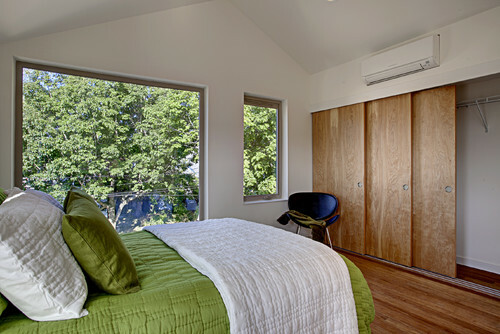 Last night, it dawned on me that since ductless mini splits have been used in other countries for quite some time now, and are becoming more and more popular here in the U.S., designers have undoubtedly come up with some clever ways to disguise them. So I hopped over to Houzz to see what I could find. This one is my favorite. In fact, I think it’s actually really pretty. Or I could just hang it on the wall and ignore it. 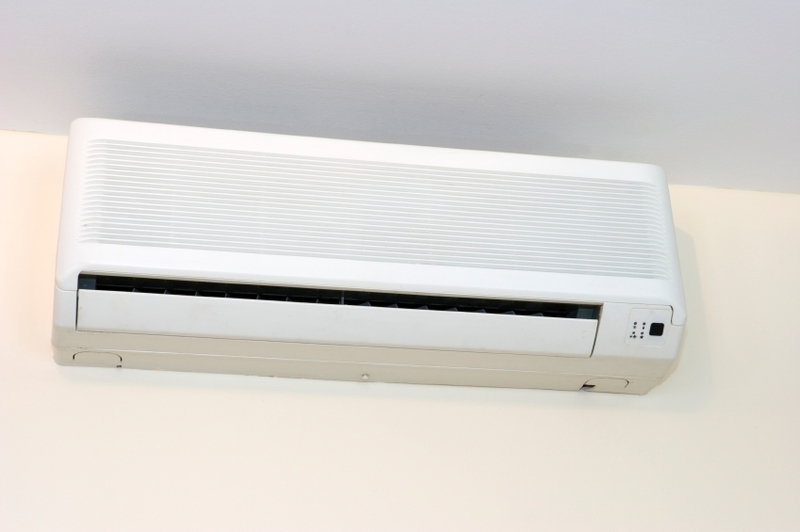 Do any of you have ductless mini split units in your homes? If so, I’d love to know what you think about them. What brand do you have, and have you been pleased with it? I got prices for one Trane and two Mitsubishi models. Did you install it yourself, or have it professionally installed? The prices I got were for professional installation because the thought of doing it myself really intimidates me, although the videos make it look pretty easy. So if you have one, I’d love to know your experience with it and your thoughts about it. My cousin has the ductless and when I house sat I was impressed! Have been looking into for my home. Cooled better and quicker than regular ones I’ve experienced. I have two, here in Canada. One in the kitchen and another in my bedroom. (My house is too old for Central Air). They are Mitsubishi. I put contact paper on the kitchen one. Had them for 3 years. Love them! Oddly, my sister just bought a home in Connecticut that has several mini-splits. Apparently, you can size the outdoor unit for multiple indoor units (which is a benefit). Supposedly, they both heat and cool her house decently (she hasn’t been there for a New England winter yet, so we’ll see). That’s another nice benefit of the min-splits…they can run “backwards” and provide heat. 1) What do the HVAC guys say about your plans for the sun room (family room)? Are you going to have the same problem there? If so, maybe you should consider that when sizing the unit for this room. 2) What about the high-velocity ducted systems? 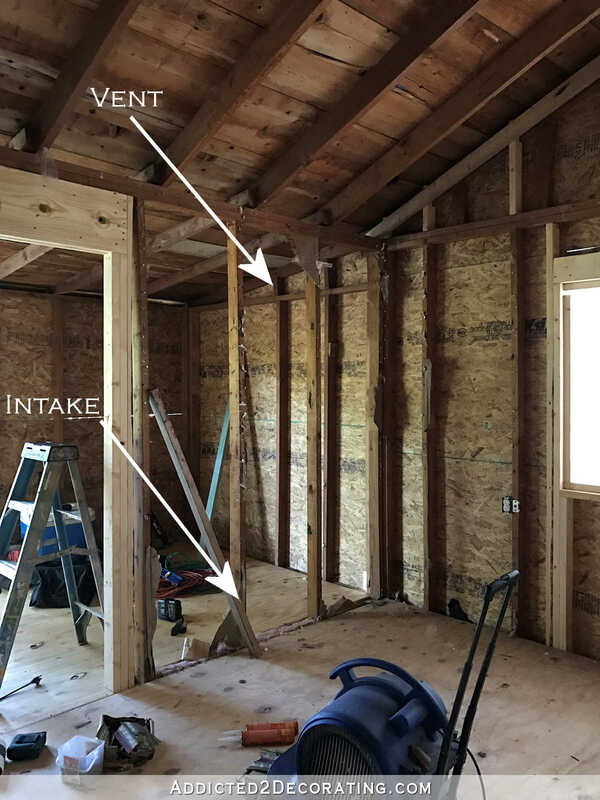 My understanding of those (from watching TOH) is that they use mostly smaller ducts that can fit in a standard wall and ceiling without having to drop it. Granted, you’d still need a utility closet for the heat exchanger. 3) If you cover it with screening like that photo above, is it going to mess with the airflow? Most ductless systems I’ve seen have fins that open and close and direct air in a certain direction for efficiency. If you put a screen in front of the fins, it’s going to change the way the air flows. 4) Would you be less bothered by a built-in through-the-wall unit tucked down low somewhere? I know they may seem like add-ons and inefficient but AC has come a long way in the last 10-15 years and they can sometimes be just as efficient as other options. We have one in our large, high-ceiling living room and it cools the whole house pretty cheaply and quickly. I was surprised by it when we moved-in. They are noisier, though. My only regret is we did not do it sooner !! we had one in our old house in the attic which had a finished room. Exact situation as yours-not a reasonable choice to use existing HVAC. My space was much smaller but I have no complaints about it. It worked well, was quiet and I liked that I could separately adjust temp to suit my use and needs from the whole house system. My in-laws has one in their enclosed porch. It works good there, but it is one room. How will you have cooling in your bath and mudroom area? They might get some of the cool air, but certainly not be as comfortable and especially when you close the door to the bathroom. The mudroom is so open to the studio that he said the unit would easily heat and cool it as well. The bathroom is more closed off, but since no one will be spending a great deal of time in there, it shouldn’t be a big deal. It’ll still get at least some heat and air circulating through there. I lived in Italy for 3 years and we had those units, one upstairs and one downstairs. Our upstairs one was in the hallway with 3 bedrooms and 2 bathrooms up there. It did remarkably well cooling off all the spaces. On really hot days our bedroom wouldn’t cool quite as well as we would have liked, but nothing a fan couldn’t fix. I have never even heard of a ductless mini split! We lived in Germany for 18 months in the early 90’s and I don’t recall ever seeing one of those. But I do think that sometimes you just have to sacrifice for practicality. If this thing really works, why not save the money and have a more efficient system? I cannot imagine you just hanging it on the wall and leaving it there however, because I bet that would drive you crazy every time you have to look at it. So, I like the idea of a decorative covering like the meal screen with a grating over it. (See picture from Spruce Interior Design) It kind of reminds me how people in the old day used to cover their radiators. I think it looks just fine. We are looking at doing one in our game/craft room. It’s a large room in a shop building that currently has a window unit. We are leaning towards DIY to save money and the basic install seems simple enough (and my bonus dad has done several). We’d love a Mitsubishi but for our space that isn’t used all day only a few hours in the evenings or on weekends we can’t justify the extra expense. We are looking at off brands. Even thru Amazon. I’ll be watching closely to see how you proceed. And I never thought about disguising it. Love that idea! Maybe that will work for you? I have a Pioneer mini split in my approximately 700 sq ft garage conversion mother in law apartment my son in law did for me and I love it. Keeps me cool and warm all year long. I do have ceiling fans in the living room/kitchen and bedroom because I’m in Texas like you are and we just need to have our fans! Love the cover ideas. Good luck. My husband installed one in his workroom/shop area (12’x22′) off the garage, and it does a great job in summer and winter, even with no ceiling insulation. We have learned though, that when we set the remote to a certain temperature, it is very sensitive and if the room gets too cold in the summer, it will actually turn the heat on to bring the temperature to your setting, instead of just turning the a/c off and letting the air temperature adjust itself. The same thing can happen in the winter if we have it set on a certain temperature and it warms up during the day and brings the temperature up above your desired temperature, the a/c will come on to bring the temperature down to your desired temperature setting. That is the only issue we have seen. The split unit has definitely been able to handle our sweltering heat in East Texas, as well as the humidity. Great tip – I’ve been thinking of putting one in my garage/shop. Also good to know about the fact that it will turn the heat on to warm up the place if it goets too cold. Hi Kristi, I have 2 actually.ha! We have one in our garage conversion family room and one in our back porch that was gutted and insulated to be an all year sun-room. To be honest, I don’t always like how they look(except for those pictures…haven’t seen that before:)), but I am really happy with how well they work! The sun-room and our family room are both long rooms and they do really well all year round. They are high up and have directional flow with the fans. The units don’t take up a whole lot of room on the inside or outside of the house. They are also very quiet unlike the old hotel heater/ac units. They have remote controlling with fan directions and different modes. And….surprisingly they don’t have to be serviced nearly as much as our other stupid main central heat pump units. haha. Anyway, you will have to gather all the pros and cons to it all but hope this adds some ideas to your pros and cons list. Yes, we renovated a whole home that had baseboard heating. We wanted to remove that due to the operation cost and inefficiency. Also, they take up so much space and always seem to be placed where you want to put furniture or draperies. Also, we have pine ceilings and didn’t want to tear those out to install ducting. So, we installed one head in the great room and one in the master bedroom. We love that we now have both cooling AND heating. Here in Western Washington, we need both. But – they’re not attractive. After going through a year long renovation and ending up with a pretty little lake house, I really disliked having to install it in the great room right on the main wall. I’m still trying to find ways to make it look better. We have another one in the bedroom but we were able to install that one in a less conspicuous spot and it doesn’t bother me. For our offices and bathrooms I had small electric wall heaters installed, so the mini split was just to heat and cool the main spaces. Our contractor purchased and installed the unit, so I’m sure we overpaid for it as opposed to buying it ourselves and having them put it in. Other than the looks of it, I’m very happy with how it operates and are good with the decision to not go with central. For us, it was the right decision all the way around, and I’m sure someday I’ll find a creative way to disguise it! In New Jersey my friend has a Mitsubishi mini split and she loves it. I would go with the wall air conditioner. In the model home here in Florida they turned a two car garage into a design center with one of these installed. It is very effective. However, as I understand it, they also require a compresser outside. What they had looks just like your picture of the mini split. I was thinking of putting one in my garage due to the heat here. Kristi, we had an outdoor closet for the AC unit in our addition and it was awful. Always dirty, plus critters. When we replaced the AC, we put a package unit on the roof only b/c the duct work was already there. Not suggesting you do that. Otherwise we would have done a mini-split. They are way more efficient. Even in Tucson summers, my neighbors who have them, LOVE them. We hit 119 or close to it several times this summer. I have a ductless mini-split! My house is a 1.5 story, with the entire upstairs being our master bedroom. The house originally had a swamp cooler, but with a steep roof and shake shingles, I thought my husband was going to fall off the roof everytime he had to winterize/summerize it! We switched to central air using our current ducts from having central heating, but our upstairs master bedroom was unbearably hot. The HVAC guys had told us it would be, but we just figured we worry about that later. My dad owns a store that sells Frigidaire appliances, and we ordered a Frigidaire energy-efficient ductless mini-split unit. It is what dreams are made of! We did not buy a unit that heats also, as we did not need that. The unit seems to ease the strain on our main central air unit, while allowing us to sleep in cool temps! Also, my summer electric bill has been reduced by about 30-40%. The unit we ordered was rated for about 1100 square feet, and our upstairs is about 600 feet. One thing I love is that it will cool down the space in about 5-10 minutes, much faster than it would take my central air unit to cool a portion of the house. The hardest part was installing it, because we had to get 220 electrical up to the space, which was necessary for the energy-efficient model. We did it ourselves after an electrician quoted us $2k! We also had to find an HVAC technician to come charge the freon (not sure the right term there) and when we finally found one that would come, he didn’t have the right attachment for our unit. All in all, with mostly doing it ourselves, we spent about $1400 for the unit and HVAC guy and electrical parts. I have no regrets! 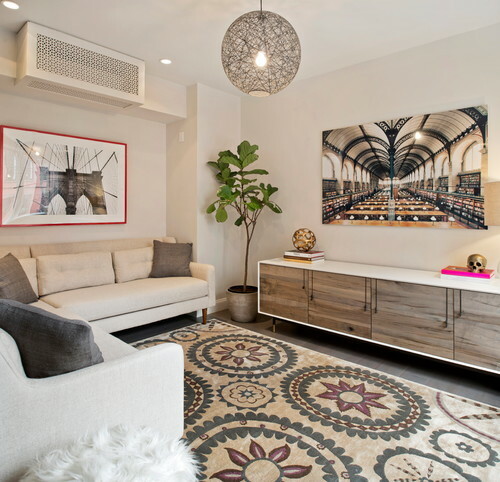 As far as decor, the unit is part of a floor-to-ceiling gallery wall and is either hardly noticeable, or I’ve embraced the look due to my affection for cool air! If you were just doing the studio, what about the next additions? Crazy idea part…Eventually you’ll do your master bed/bath, have you thought perhaps spending a little $ now to prep to split into two? Lay some ductwork in any hard to reach spaces so you could do the split later, cut holes for the vents in your drywall, incorporate the studio. Then you could re-locate the mini split for the workshop, Is that too much planning ahead? Outside of that moment of crazy, your plan seems great. We have one upstairs to heat/cool our bedrooms…as our radiators dont function properly in our 80 year old home. I LOVE how it works, not how it looks. I am okay with it though…. Maybe because it’s not in our entertaining space? We have had it 4 years and it’s a Mitsubishi. For me, the mini-split is the winner, hands-down! Not only is it cheaper to purchase, it’s much cheaper to run than the alternatives. I have one in my house which was installed by the previous owner. I’m not sure I would have spent the money otherwise, but, knowing what I know now, there’s no question. I live in Moncton, New Brunswick, and we have cold winters and warm summers. I reckon the mini-split saves me at least 50% on my heating/cooling costs. As for looks, I just thank the thing every time I see it and let it be there in all its ugly glory, which is pretty much what everybody does. It disappears after a while. I wouldn’t recommend screening or any other covering that would interfere with airflow because it, well, interferes with the air flow. My neighbors have a ductless split in their sunroom. They love it and it keeps the room cool and warm in the worst conditions. So, we have a 1950s ranch house in NJ that came with baseboard heating in two zones. No air conditioning. So after a year of window units, we decided to invest in a mini-split unit. It’s one outdoor compressor and two indoor units (one in our living room and one in the master bedroom). They both have AC and heat function and are made by Panasonic. They probably cost about $7k all in, but my husband got the materials at cost through work, and we paid some kid off the books to do it for i think $5k – the first estimate we got for install only was $10k, but worth EVERY PENNY to have AC in the summer. Yesterday it was like 98 degrees here and I was working inside wearing sweatpants and a hoodie and did not notice the heat until I went out to get the mail. It’s always on and just keeps our house at a cool 75. No window units. We love it. I wouldn’t DIY, though – there was a lot of components and it took them like a full day. In terms of install, I thought they had to be installed on an exterior wall. I imagine you’d know more than i would (and your HVAC guy) but that’s just one watchout. I didn’t bother to try to “disguise” it, but I did try to consider where they went in the room. I insisted that the one in our LR went centered above the window vs like in the corner, and then put a curtain rod across it in two pieces. It kind of fades into the background, and i’m just thankful for AC! The one in my bedroom is like in a corner where again, it sort of fades into the background. I always just get used to things that aren’t perfect, but I’m not a designer. Anyway, I think they are great and recommend them to all of my friends who live in old houses where you can’t easily add central air. Good luck! My parents have one in their loft above the garage. It was really their only option since the garage is detached. It works great. It provides heat and air. The down side is that although it works great….it works great when it works. In the 10 years since they installed it, (it is a Mitsubishi) they have had to have work done on it twice. It was under warranty the first time but the second time it wasn’t. However they have fought with Mitsubishi over it because it was a fault with the machine itself. They got most of it covered the second time it failed. I eventually want one in my upstairs because the upstairs of my house doesn’t get very cool because there are two dormer rooms built on later that they didn’t run ductwork to…..There is a window unit in the one room up there that does have air vents however the air from my HVAC doesn’t reach it. So I think they are worth it but be prepared if you get a faulty one to have someone in replacing it….which also makes me think that it should be installed professionally. 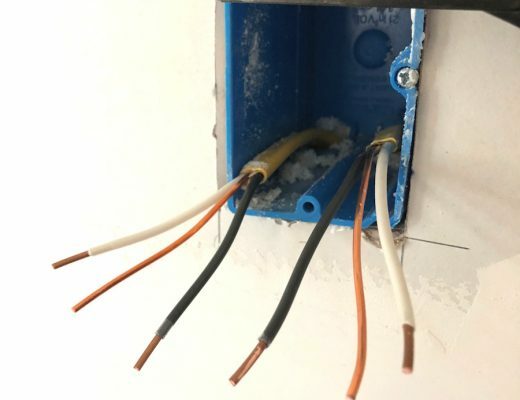 So that there isn’t any question about it not be installed properly by you the homeowner. I am rehabbing in an area where I just put Central HVAC into the first floor running on gas, free gas line courtesy of the Utility. However, would need separate unit for upstairs and have to give up the attic which I eventually want to use a full third floor as it is possible to do. Adding Ductwork up there would be a real problem. I will revisit the idea when attic is cleared but not quite finished with drywall as to how invasive it will be and how much space will be lost. Speaking to other residents around here, they have heat pumps piggybacked on to a main central HVAC system. Not sure how it works yet. But they have, as I now do, central HVAC for the first floor and heat pump that provides AC and heat on the second and third floors and in one case, a major addition to the house as you have in converting your garage. Apparently, a heat pump is good in this area except for the most extremes in temperature, which of course is when we need intervention the most. Thats why having it somehow backed by an cerntral system that can’t quite cover all that area is a benefit. It’s cheap in terms of install as well as cost of use. Have you gotten cost estimates of what the bills will be in using the ductless mini split for the garage. My mother lived with one of these in Asia, and she kept the place at close to 90 in the summer and 45 in the winter due to costs. She was very frugal. But what are the ongoing bills for such a system here in the US, in particular, the specific one you are eyeing? You pay for installation and purchase once, but the bills go on. I purchased a 12,000 BTU 13 SEER Mini Split Air Conditioner w/ Heat Pump A13CHEM4H4G12 by Air Con for my new sun room 5 years ago. I only use it when I am going to be spending time in that room. It does cost more in electricity to use it but it has worked well for me. I hired a man to install it and then I had to hire someone else to test it. You do need special equipment to test it. I am European and am very fair with these things. I also have a big studio, with very high celings, that I love. And didn’t want to give up the ceiling height so… I got a ductless system. My husband, the American, had never heard of them. But it was cheaper, quicker, cleaner… and he agreed. We’re very happy with it–seven years later. It also cools/heats the room very quickly. LG makes one called Art Cool and I’ve used it clients’ homes and they’ve all loved the camouflage option. Good luck with rhe decision-making! Wow! Thanks for posting about these. The Art Cool ones are very cool, but I’m really liking the ceiling mounted ones. Either seem like a great choice for Kristi’s studio and I’m now starting to think about adding them to my old house. I would love to be able to open those windows! Thank you so much for this educational post!!! I will certainly be looking into these units for our small, but perfect for us home! I am super excited to see how this decision unfolds for you. We have been considering a mini split system for the upstairs bedrooms in our 70’s split level. When we run central air, the downstairs is arctic and the upstairs is 10-20 degrees hotter with NO air flow. I believe we’d need to upgrade our electrical panel to accomplish this, though, so it’s not the cheapest solution short term. Good luck as you continue on your studio journey – it’s going to be great! Many people in NYC , including myself , has split AC. I love it. It works great. I don’t like having the vent on the wall, but honestly, you stop noticing it. The bathroom will be fine if it’s on the same level…as in, not upstairs or downstairs. We had a 22 SEER Trane mini split installed in a separate workshop on our property last fall and have been very happy with it. This is middle Georgia and it has easily maintained 72 degrees this summer. It kept it comfortably warm all last winter. It also has a setting to neither heat nor cool, just dehumidify but we haven’t used that yet. First bid we got was $4300 for the unit and labor and the second we got was $2300 so guess who we went with. We upgraded the unit and ended up paying $2600. I don’t know what was up with the first guy, he knew what we wanted him to do before he came out, he sort of had an attitude. The installers we did use were great and the proof is in the pudding, 10 months of happiness. We are currently in the process of designing a mini-split system for a complete house remodel of about 2400 sq. ft. We plan to install it ourselves and possibly hire someone to help start it up. 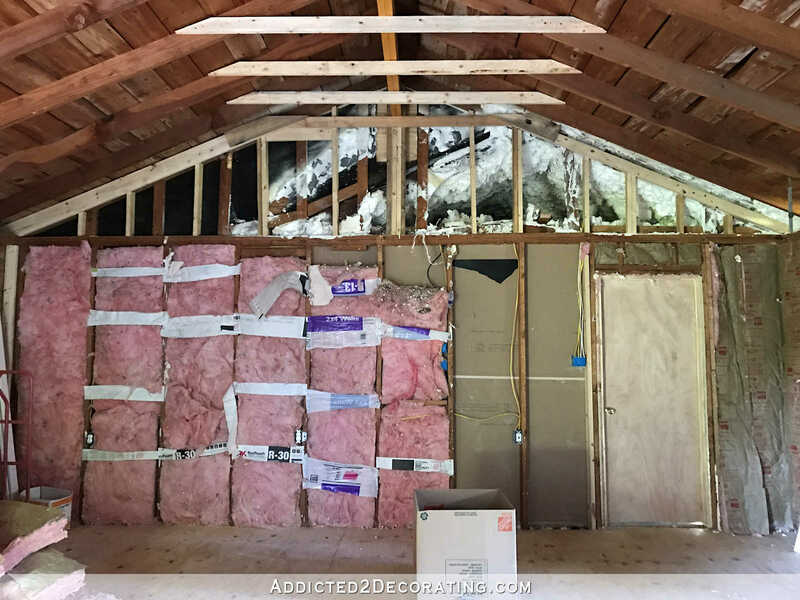 The house has an open rafter area about 24′ x 30′ which will function as our living room and the remainder of the house is a two story gambrel design. The beauty is that we can located the piping behind the wall board; so can you. And being in West Texas, I understand your concerns for efficiency and reliability. There are lots of brands. Ebay even sells some lower cost units. I know someone who bought a very inexpensive system from Ebay, installed it himself and has been using it here for about three years. He’s very happy with it. Also, there are some very, very reliable systems that come with a high price tag. Daikin is one. They also have ones that can fit between your ceiling joists and look more like a typical register. You might want to look into that profile. Good luck on your decision making. I know it’s tough. Contact me for more info if you wish. Neighbor has 600 sq ft “shop” with a Sanyo unit. This fellow is a semi-retired Master Electrician. He had his Sanyo mini installed several years ago by the local dealer and was SO glad he did. After FOUR service calls (on warranty) the unit finally worked correctly and he loves it. An experienced installer is paramount…and just like any outdoor unit, it should be installed on a poured cement pad, not the cheap plastic pad that is the norm. We installed a Mitsubishi in our second home in Alaska, not for the AC but for heat . My husband did a lot of research and determined Mitsubishi the best. We loved it (since sold the house)) it was whisper quiet and extremely efficient. 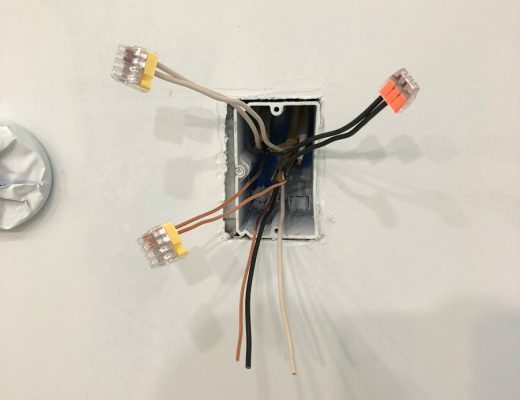 Our neighbor in Arizona also installed a mini split in their master bedroom so that they could cool that room independently of the central AC. I was at first like you in hating the look but after having one I found it really does disappear into the wall. I would do one again in heart beat, and highly recommend the Mitsubishi! We have them in our house on Cape Cod, where we only use AC for a short time each summer. For us, with limited use, they are perfect and much more efficient! Love them! I think if you go with this you need to embrace the pretty and go with the one with the pretty grate around it. Love it!!! I thought of you when I came across this site for flooring. I’d totally do one of these in my new sewing room if I had to start over again. SOOO pretty!! We love our split and plan to install another one upstairs. Hubby works in HVAC and recommends them all the time. Your situation seems perfect for it! We have a Mitsubishi in our detached 2 car garage/shop with a high ceiling like yours and love it! It cools very quickly (we are in the DFW area) and so far, no issues although it has only been a couple of years. Ours was professionally installed but we shopped around for install pricing. It seems a couple of A/C contractors were not bashful about kicking up the price and hoping we wouldn’t notice since these are not as common yet. Good Luck. We have 3 mini splits that we added almost 4 years ago to our old house to replace window air conditioners. We put one on each floor – basement, main, walk up finished attic. We really like them. They run on one compressor and we can set the temperature for each floor. Each one is sized for the square footage of each floor. We live in central VA. It is 107 today and my house – even the finished attic, is quite comfortable right now. I wanted to cover mine up, especially the one that had to be placed within view of the front door, but if you do some investigating at official mini split sites, they should NOT be covered. Without getting technical, the airflow will be hindered and will affect the correct temperature setting, etc. I live in Izmir, Turkey and almost all of the houses have split A/C here. You should consider purchasing an inverter one and have it installed by professionals… mitsubishi makes good ones but please research if you can find Midea in Texas. Professionally install a Daikin unit. You’ll be happy with it. we’ve put in tons of them in Idaho and they are a great solution. Sorry, but I laughed a little this time! 😀 What’s wrong with a small appliance like the AC is? 😀 I’m currently sitting under mine and I love it! Ok, Europe here, I admit. I suppose to me those huge ducts (that are so common for you) seem yucky, as I imagine them getting dirty after a couple of decades, which would never happen with the AC unit (apart from the fact that it’s small and you can clean it, you’d throw it out and get a more efficient unit anyway). Unless we are talking about something else that looks exactly the same, in which case forgive me. As for not seeing them around there, didn’t you rip two similar units from your living room windows when you moved in? a) Nobody around here installs them himself, but the company that sells them usually sends the installers to do it during delivery. I think you need to be careful for the gas not to leak, and insulation of the pipes between the inner and outer part, but that’s mostly a guess. Anyway, better let the pros do it. b) The unit needs to have its air circulation uninterrupted. The first photo you found looks like it’s on the verge of disrupting efficiency, and for the second, the shelf would probably interfere somewhat if you try to make it blow air downwards. (Also, I would expect it to get filthy, as you can’t move the device AT ALL to clean around). Bear in mind that you have to open it (the front part of it) and clean the filters from time to time (a very simple thing to do). c) We normally don’t decorate them/around them, as it’s a functional part and it tends to “not register” in the brain when you look at a room (then again, if it’s not a common sight there, that probably won’t apply). Personally I did have an issue with one of my units, because the installer put it too low and directly opposite my entrance and it was sticking out too much. In the end I bought decorative pvc panels and hung in front of it (in some distance); they are light enough to move IF they disrupt air flow, but they don’t really move much. I’ve been trying to find a picture of them for half an hour and can’t for some reason, but I promise to come back (or send you a photo of my panels in a msg on facebook). d) Mitsubishi is a good brand from what I know, the other one I haven’t heard of (maybe it’s made there). What matters a lot though is how powerful the unit is (BTU), as it has to correspond to the area that it’s expected to cover. Also, around here I think cooling appliances come in a special “tropical” version to stand the extra heat, I would imagine the same applies to your area (though usually we don’t even hear this “tropical” part of the description, in a bigger country maybe there would be both versions – my point is, ask if they are sure it’s going to stand the extra heat). That’s all, I hope it helps! and I hang them in a configuration like this: https://ae01.alicdn.com/img/pb/611/961/697/697961611_765.jpg (it matches my space well, but if I were doing it on a big wall I’d probably put a couple of panels to the left and right of the AC unit). We put one in our bedroom to take some of the load off our 15 year old heat pump and oh my goodness it is heavenly!! It cools wonderfully. We have never used the heat because our bedroom is upstairs and we don’t need it. Our first experience with the split units were at our church. They are very, very quiet and efficient. The only regret is that we did not get one sooner. I am like you about the looks but to be comfortable it is getting prettier and prettier. Ha! I don’t have mini splits in my home but have lived in places that so. One place is near Wichita, Kansas – a place my husband and I go to turkey hunt. We rent a lovely 2 bedroom cabin that used mini splits and they were very comfortable and quiet. I think it is your most practical option. We have two mini-splits. One is in our mud room and one is in our garage. We use them as needed here in Kentucky and really love them. Plus, we have had them in many, many hotel rooms around the world. I wondered if your current A/C could accommodate your studio. I don’t have experience with the European heating/cooling system but your post will have me looking into them for our family room. It was once a part of the garage and a previous owner converted it into a family room but it is hard to heat/cool because it’s so far away from our furnace/A/C unit. I don’t have any words of wisdom on your choices but I’m sure you will do your research and read the comments from knowledgeable readers. Good luck! We have one and love it, but it only does the one room, the other two rooms we have window ac. It was there when we bought the place, but very pleased with it. I have had them in three houses overseas and love them! When we lived in Valencia, Spain, we had a very HOT summer. Half the house was HVAC and the other the mini split. The mini split won hands down against the HVAC. I can’t remember the brand tho. We had Mistubishi in Turkey and Haier in China. Both were good. We are most likely installing in our next house. If this was your living room, I’d say to forget the mini-split. However, it’s a work room and some allowances could be made in the room design because of the room’s function. Maybe you could hang it so that it wasn’t the first thing you saw upon entering the room? We have 4 in our house, although we rarely use all out once. We only use them when the heat and humidity is unbearable as electricity in Australia is expensive. We can, and often do, choose to use the dry setting, which removes the humidity from the air, lowering the temperature immensely. A far more efficient way of running them. Ours are getting old so the new ones are a lot more efficient. Mini split is totally fine in a “utility” room (garage, workshop, studio) but I personally wouldn’t use in more “living” areas (bedrooms, living rooms, kitchens, etc). For some reason I just feel more utilitarian items such as a mini split, make sense in more of a “working” space vs a “living” space. I’d save the cash and go mini! I feel like the idea of two separate units is going to be great! Then you will never feel like you are wasting money heating or cooling a space you aren’t using. You can make the studio the right temperature for whatever you are doing, and that might just be different than what you want the rest of the house to be. Our first home had an upstairs and downstairs unit. Our current home just has one unit for both levels. It is annoying. I almost want to move just to get two units again. LG also makes some very nicely decorated wall units, one they call art cool that is a painting mounted onto a thick frame that air blows from the sides. Another advantage to mini splits is they normally start at a higher SEER (efficiency) rating and are typically quieter. A disadvantage to minisplit is they may not offer as good part warranties. Also, finding experienced serviceman that can properly diagnose and repair them can be difficult due to lack of proper training from most trade schools. I enclosed my garage a few months back and installed a Carrier/Toshiba ductless unit and have been completely satisfied with it. Hope some of this helps. Good luck to you. I am a Texan living in North Dakota and this is the first house i’ve lived in that doesn’t have central A/C. We have three mini ductless units and they work wonderfully. We have one in our dining room that we placed art around to king of hide it. I recommend it and believe you have the skills to not make it an eye sore. We have three units in our 1100 s.f. cabin; two in the living/dining/kitchen and one in the bedroom. We’ve had them two years and like them. My husband is an industrial electrical engineer, but let the pros install everything. One difference from what you’ve shown is that ours are floor units. They’re about 24″x24″x8″ and sit under the windows. The cost was less than installing new central HVAC with new ducts. Possible rebates through power company for additional savings? We just installed a ducted minisplit in our basement. I share your dislike of the plastic box on the wall and our architect told us about these ducted systems that sit in the top of a closet or in the ceiling or somewhere else hidden with a big duct facing the room to be cooled. In your case you could put it in your attic and just have a vent in the spot where you were planning to hang the plastic box. It’s quiet, powerful and totally hidden away! We have a few in our house – in total they are a large enough capacity to heat/cool the whole place. Central airconditioning is not really done in homes here, so this is what I am used to seeing. They work well and the modular nature means we can only switch on the ones we need for the rooms we are using and turn the rest off. We have Samsung brand and are happy with them. I’m not sure if the older non-inverter types are still sold in the US, but if so definitely go for the inverter type, they are more expensive but much more energy efficient. We use them for A/C in the summer and heating in the winter, and find that that is enough (although, granted, we live in a pretty temperate climate, Jhb South Africa). 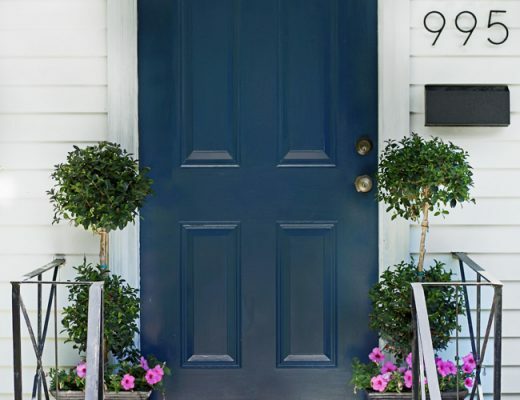 Ours were professionally installed – this was a requirement for the product warranty, which is something to check out and consider before planning to install yourself. That said, I watched the guys install it and it didn’t look particularly complicated, I’m sure you’d be able to do it. We have a ductless minisplit in the upstairs of our old 2 story farm house. It’s the only way we’ve ever been able to cool the upstairs to a comfortable level with out having to FREEZE on the 1st floor. We’ve had it several (5+) years if memory service it was about $2800 installed. The HVAC guy that installed it still sells them, but has changed brands. We didn’t do anything creative to cover it up, it’s about a wardrobe in our bedroom. I guess truthfully we didn’t care what it looked like because it made our upstairs comfortable. YES we would totally buy one again, in a heart beat.